This Easter I’m keeping it simple . 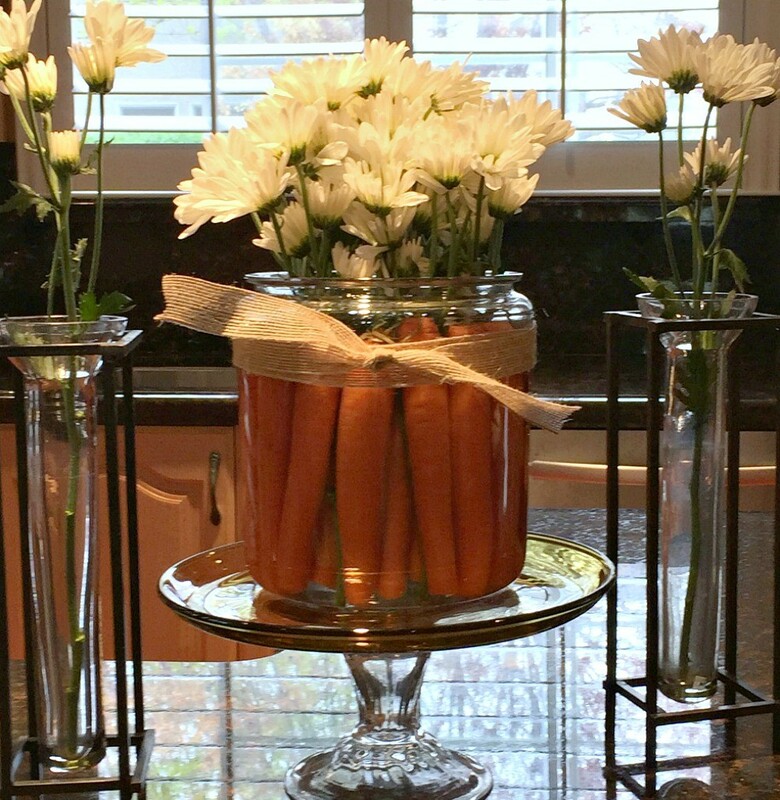 . .
Once again creating a simple flower arrangement using just carrots and daisies. 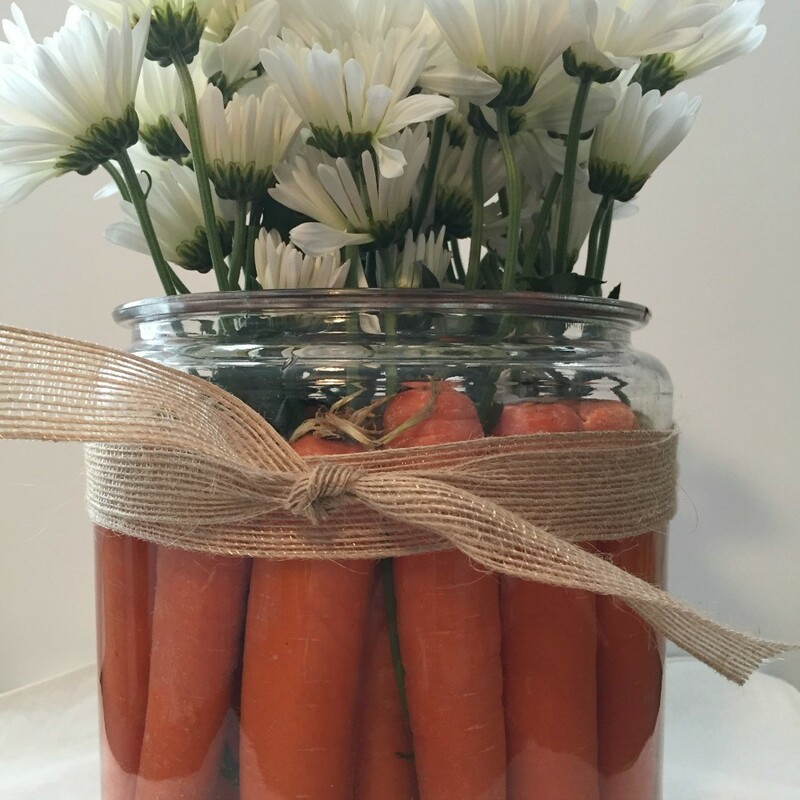 (this year I used an oversized mason jar, cut the carrots to size and fill in the jar, then cut and stick in those cute little daisies and you have yourself a fun arrangement). This one has found its home on top of a cake stand right on my kitchen island. I was fortunate to have Tori, Molly and Logan come for a visit last month and then to my surprise as soon as they left, Riley, our son decided to come home during his spring break. March was a wonderful happy family time for this momma. Then, as Easter week approached I found my home to be empty once again. But . . . 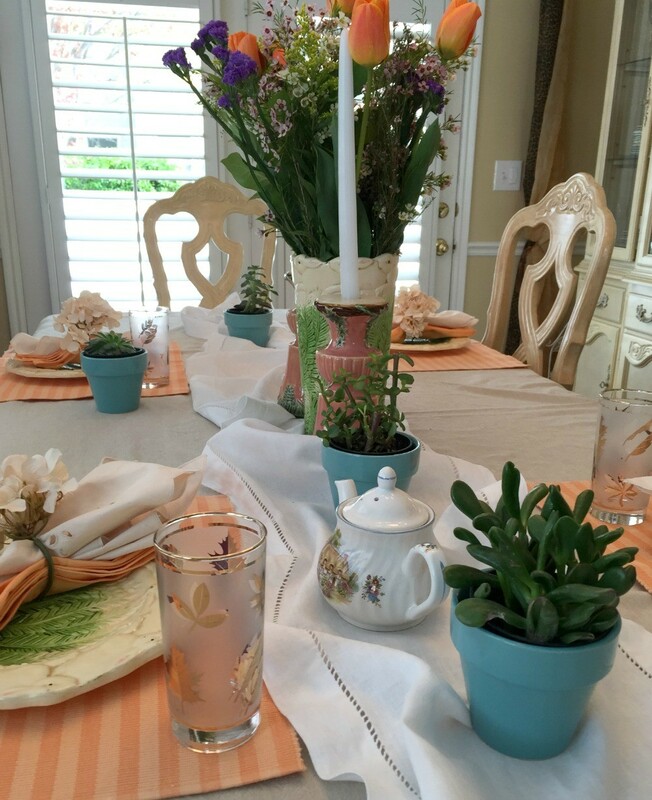 I do have extended family and lots of friends so an Easter Brunch can still be had. (actually I would probably pull a few things out even if I were all by myself). Although I am keeping it simple . . .
Only pulling out the basic pieces this year . . . Some of my favorite treasures . . .
And for the table decor . . .
I’m sticking with my Easter Traditional pieces . 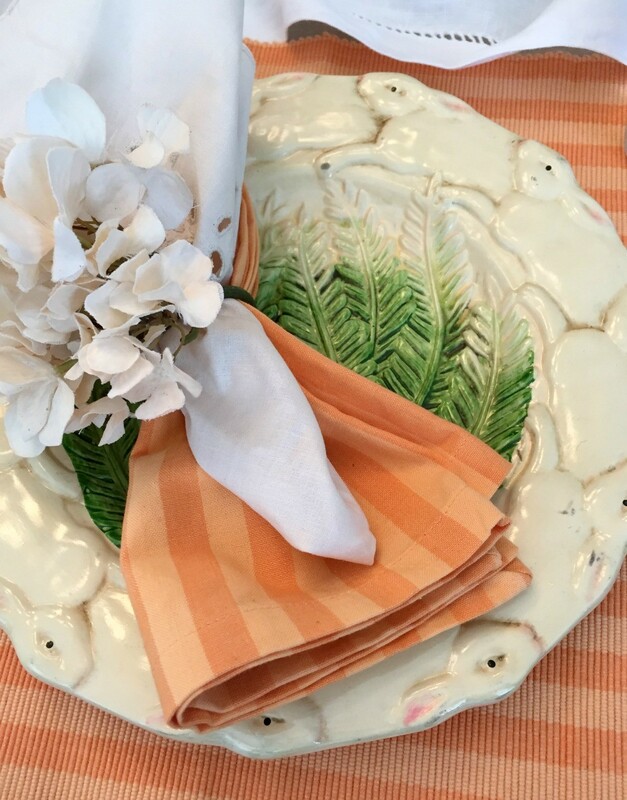 . .
Orange stripe placemats and Easter bunny/lettuce dinner plates. 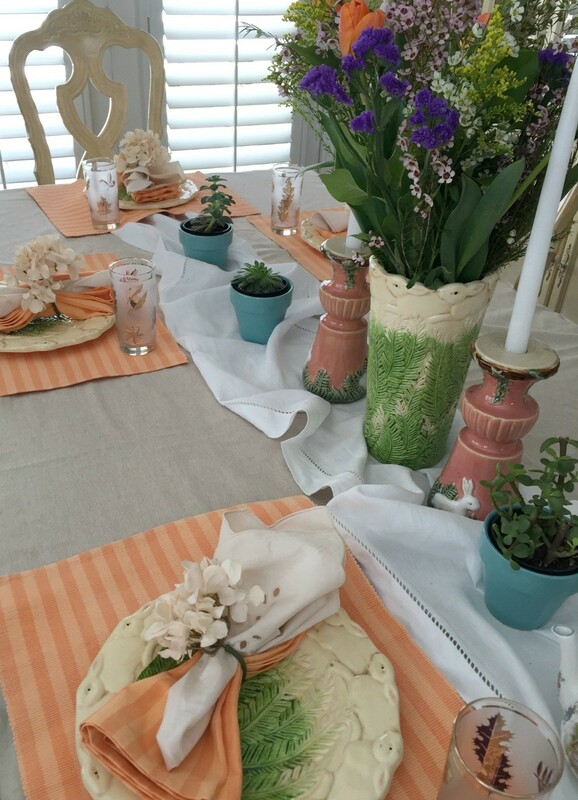 I added some whimsy to the decor by doubling the napkins and tying them together with hydrangeas. 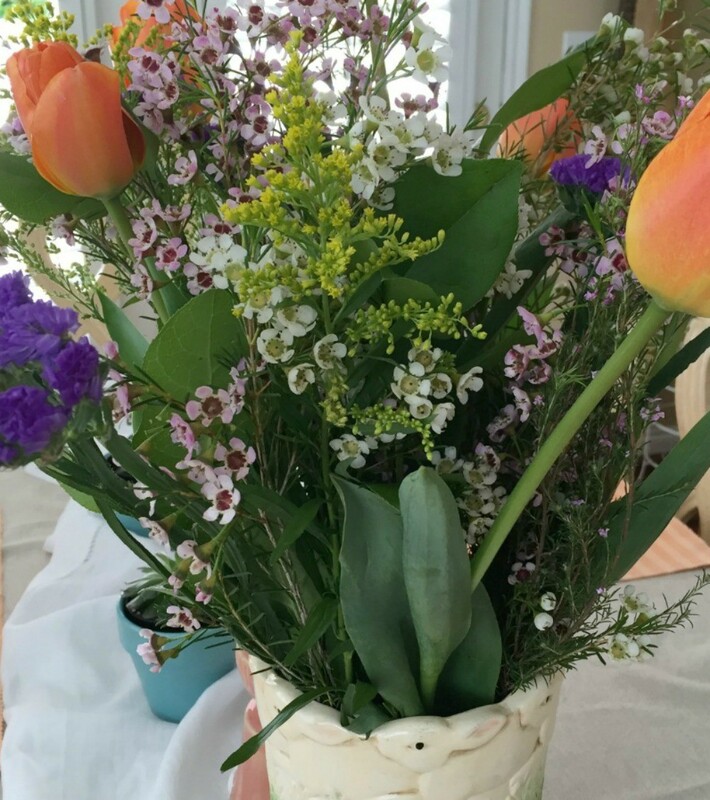 For the tablescape (centerpiece), I brought out my matching vase (with the dishes) and decided the fresh flower arrangement needed to be something with a natural, wild flower feel. 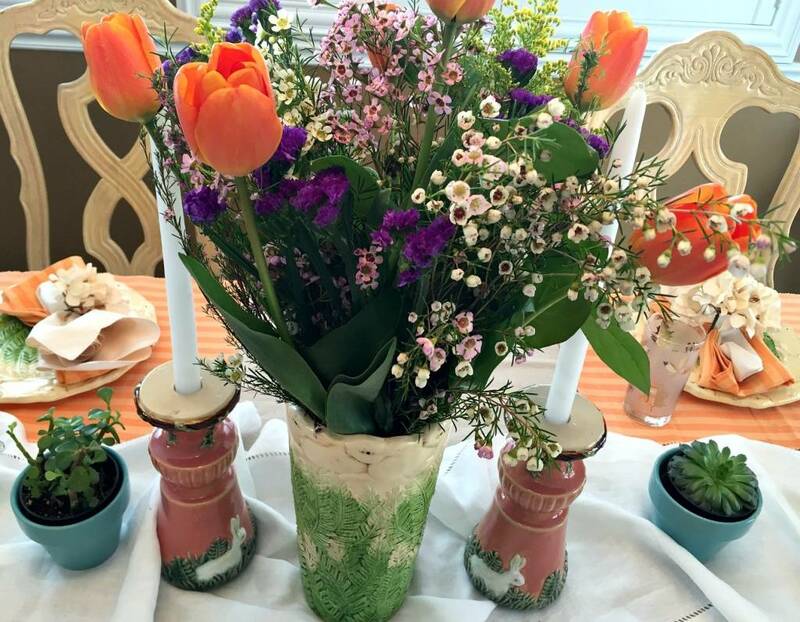 This arrangement was just what I was after except I added a few orange tulips to bring out and compliment the orange in the napkins and placemats. I then added the candle holders, a few succulents . 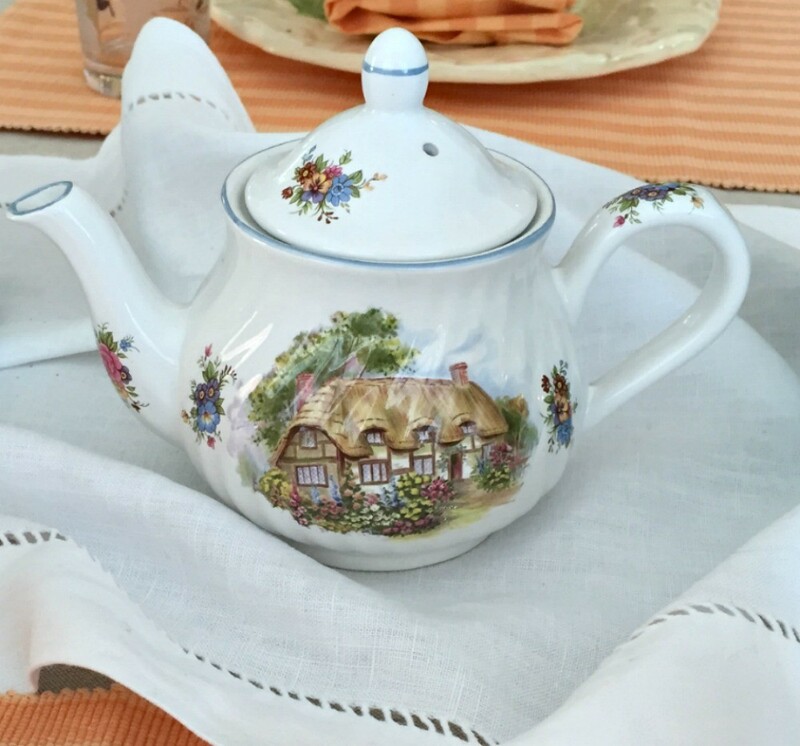 . .
A little Easter tea pot . . .
Table is set and now all I need to do is decide on the menu, yes, I might be a bit busy tomorrow. Having close family, extended family, or friends you call family over for Easter brunch is a wonderful way to remember this special day. I leave you with another simple yet touching vignette . . .
the one that reminds me what this day is all about . . .
That He Lives . . .
That He is always here . . .
That His love never fails, that we are constantly wrapped in His unconditional love . . .
And because of Him, I can go and love all around me. This video (because of Him) is quite touching and so beautiful. 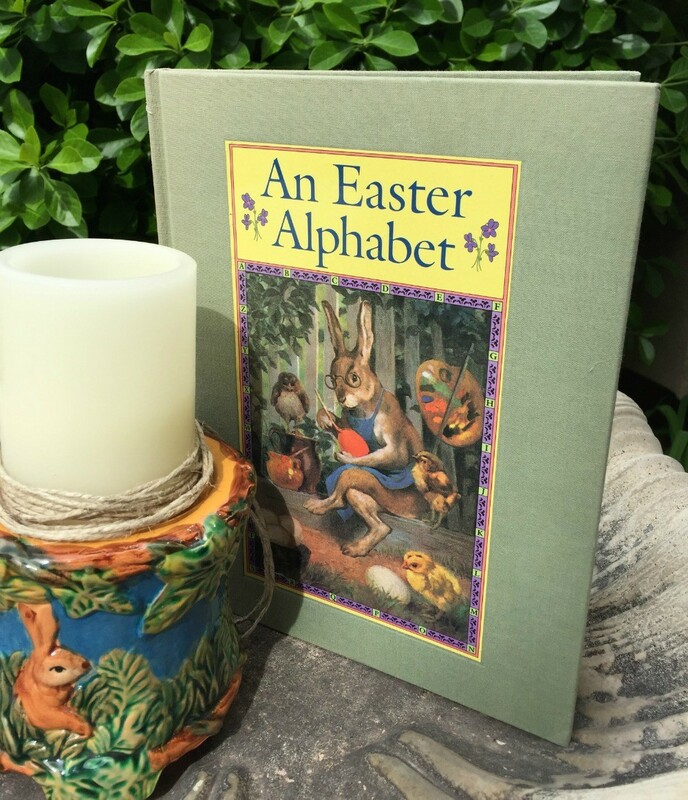 May you all have a wonderful Easter. So beautiful, and especially loved the video that is extremely important and appropriate on this Good Friday. May your days be filled with happiness knowing that you are a child of God. Your tables are always so gorgeous. You have quite the selection of themed plates too! I’ve been lazy this year. No fancy table. Have a wonderful Easter dear Trina. You have done a fantastic job with the table again. A lovely post Trina. Thank you for sharing. I love how you celebrate your faith, your love of family, and your enjoyment of the beauty around you. Your daisies and carrots are so You! What a lovely and touching post! 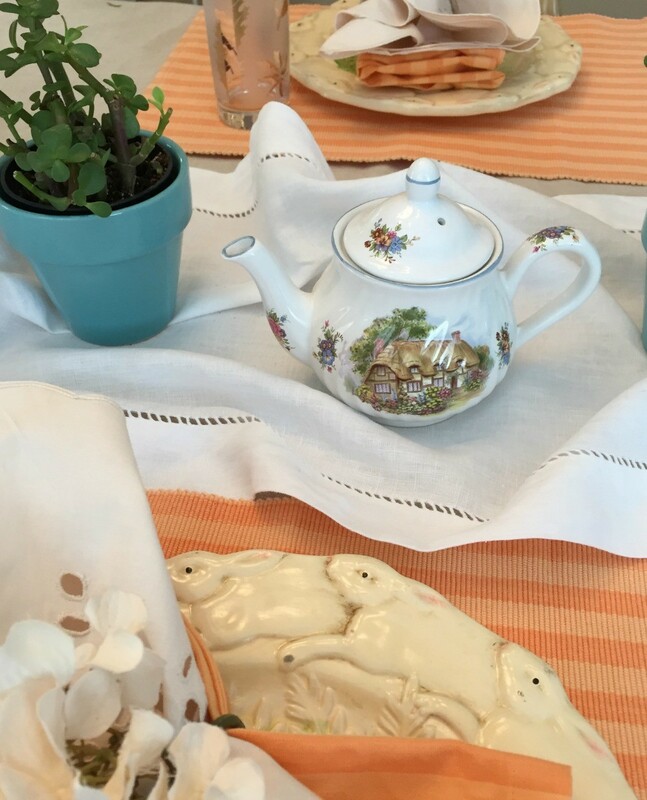 I adore the bunny and lettuce plates, with the doubled napkins and hydrangea! 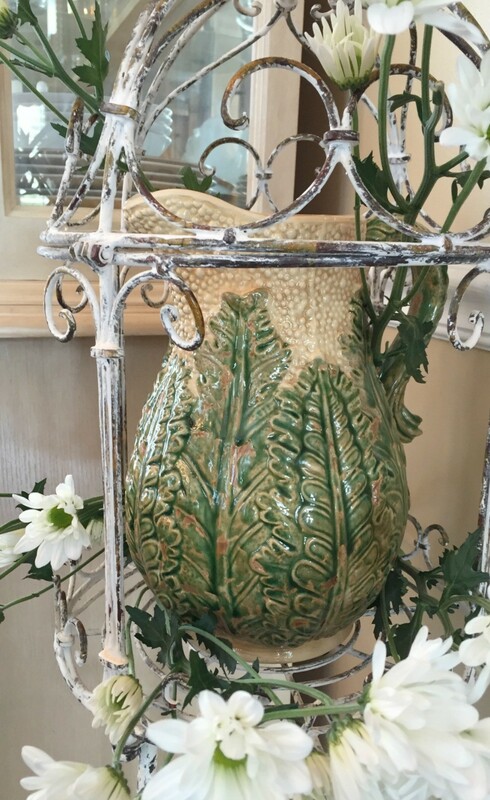 A signature Trina touch, Love the carrots and daisies, too, so original and clever. Simple beauty, the best kind. I am so glad you enjoy your family earlier ,and then got to enjoy extended family – including friends- at this wonderful brunch. Lovely end to the post too! Trina, your table is just delightful! I love the carrots in the bottle! 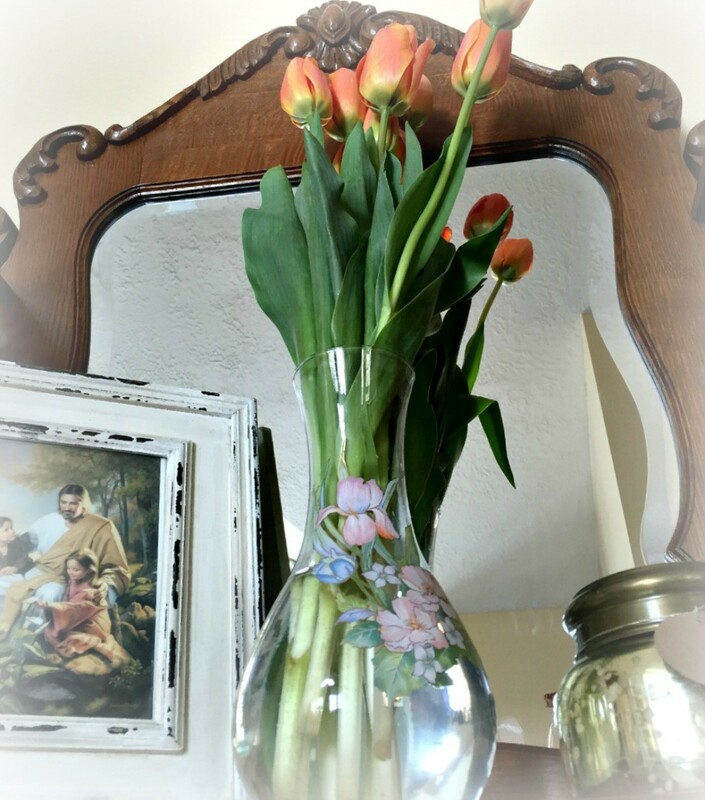 Your flowers are gorgeous and the beautiful vignette with the sweet photo of our Savior is the perfect ending! Thanks for sharing with SYC.